The UNP would talk to all Opposition parties and decide on a collective stance on holding elections though it was not the most important factor at the moment, UNP Leader Ranil Wickremesinghe said yesterday. Mr Wickremesinghe expressed this sentiment while speaking to UNP Organizations at Temple Trees last afternoon. “We will decide on a stance with regard to an election after discussing the issue with all political parties. I believe that the present Parliament could go on till August 20, 2020. “However, it will not go on until such time as Presidential Election could be held before that. 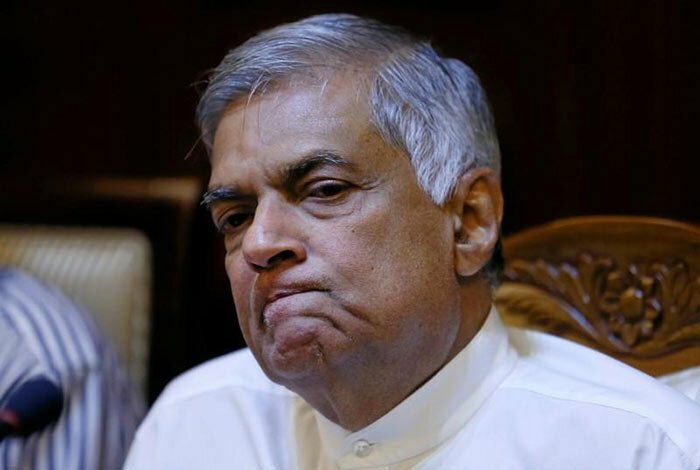 However, an election could be held only after installing a legal Government,” Mr Wickremesinghe said. “The main issue the country is facing today is the Constitutional crisis. What we should consider is whether we are to go for a referendum to get people’s opinion on the Constitution,” he added. He said that some were talking about an election as they think they could win at the election. “The No Confidence Motion (NCM) on the Government has been duly approved and is included in the Hansard. “We all saw what took place in Parliament on Friday. The Speaker had to come with Police protection to begin sessions legally. The Supreme Court had held that sessions are legal only when the Speaker is present in the chambers with the Mace as per the verdict was given in the case Samarakody vs Attorney General in 1950s. “Those who did not have the majority in the House created havoc. They threw a Bible at one of our MPs. The MP who threw the Bible at Opposition MPs were a Catholic. They would have thrown the Dhamma Pada as well if a copy was available inside the Chambers,” he also said. Mr Wickremesinghe warned that commotion could take place when the motion to stop the expenditure head of the new Constitution is debated in the House on November 29 2019. “This procedure is being followed as per the Standing Orders as requested by the President,” he said. Mr Wickremesinghe then stressed the need for carrying out awareness programmes in the national, district and constituency level. He advised the organizers to work with other political parties in doing so. He is also expected to meet Provincial Council members and members of Local Government members shortly. Opposition? JVP, TNA, Muslim Congress all support UNP. What s there to talk. These so called opposition always vote with the government. Go man Go. We don’t want you. Haven’t you done enough damage to this country and Sinhalese people. Drop dead you senile old rip rap. Mr Amarakoon I told you 95% of Sri Lankens are over employed. Now we got two prime ministers. 100% over employee. Mr Amarakoon I told you 95% of Sri Lankens are over employed. Now we got two prime ministers. 100% over employed. It is true that Sri Lanka is over employed. borrowed from all the countries of the world to keep it sustain to pay the over employed parliament and other institutions. No wonder it;s value goes down the drain day by day. Sinhala Buddhist leaders borrowing money to run the stupid parliament, receiving fabulous salaries and buying luxury vahicels, all at taxpayer expense. The first thing the fake prime Minister did was to get 2 X Bullet proof Range Rovers air freighted from the UK for the fake PM’s office. When elections are called, the fake PM travel in the bullet proof Range Rovers campaigning, telling the voters how he would reduce the price of everything and bring prosperity by undertaking massive development projects (with Chinese Money at double interest rates!). Unfortunately Ranjith, the Sinhala Buddhist voter believe this RUBBISH and vote the Buffoons into Parliament! Hon. T, S’sundaram, It seems you are hurt. Now you talk about bullet proof cars. But you never saw and talked about luxury cars used by RW and other 225 duds in the Parliament. You never head these duds increased their own salary by 225%. Also remember these 225 MPs are not entirely Sinhala Buddhists. But high bred Tamil Hindus/Christians and Muslims are there too.